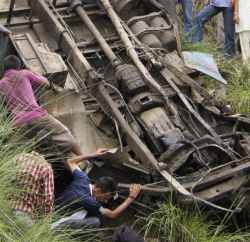 As many as 21 persons have been killed when a private bus carrying them skidded off the road and rolled down more than a 500-foot deep gorge at village Jabdoag, in Sangrah Sub-Division of district Sirmaur today morning. The ill fated bus was on its way from Uchcha Tikar to Renuka. Officials said that 19 people were died on the spot, while other two died on the way to hospital. The majority of the deceased hailed from Jabdhog village and they were identified as Nita Ram (33), Rajender (25), Rajiv (17), Hari Chand (36), Dalip Singh (34), Kalyan (45), Kanthi Ram (47), Guman Singh (35), Yash Pal (18), Kapil (20), and Joginder Singh (25). Three of the deceased belonged to village Uccha Tikkar and they were identified as Balbir Singh (20), Anil Kumar (25) and Amar Singh (40) .Guman Singh from village Manal, Virender Singh (30) from village Lana Palar. Sandhaya Sharma (34), Lajwanti (45) from village Kathiana, Asha Devi (38) from Bhatan village, Kali Ram (57) from File village and Surender Singh (45) from Deva-Manal village, were also among those killed. Governor Urmila Singh and Chief Minister Virbhadra Singh have expressed grief over the accident and conveyed their heartfelt condolences to the bereaved family members. Chief Minister directed the district administration to provide all possible assistance to the kin of those who died in the mishap. A Magisterial Inquiry has been ordered into the accident, Additional District Magistrate Sirmour has been appointed as Inquiry Officer. A sum of rupees Rs. 20 thousand each has been provided as an immediate relief to the kin of deceased. Rs. 2.50 lakh would be given to the families of deceased persons out of which Rs. one lakh would be under Passenger Ex-gratia Scheme and Rs. 1.50 lakh under relief manual. Brij Bihari lal Butail, Speaker, H.P. Vidhan Sabha, Cabinet Ministers, CPS , G.R. Musafir, Vice Chairman State Planning Commision, Ajay Bahadur Chairman HIMFED and Kush Parmar former MLA have also expressed grief over the bus accident.